i-Zen @ Kiara 1 is strategically located in Mont Kiara, one of the most sought after neighbourhoods in Kuala Lumpur. Amenities nearby include international schools, recreational clubs, shopping centre and many more. 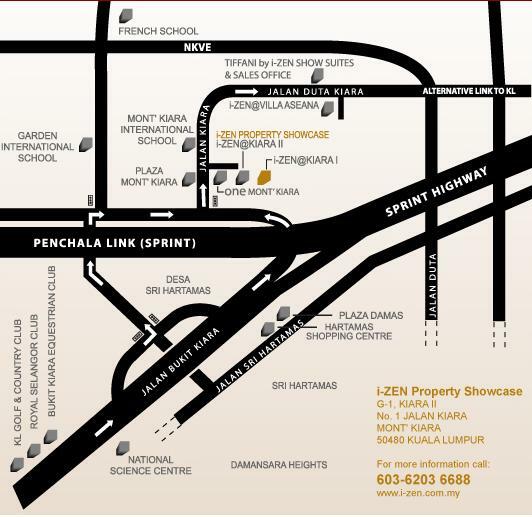 i-Zen @ Kiara 1 comprises 305 condominium units in a 35-storey building. Comes in 1, 2, 3 and 3+1 bedrooms, each has a built-up sizes from 805 sq.ft. Facilities include a swimming pool, floating deck, linear lounge, recreational facilities, landscape garden and children's playground.